Both the teams are coming from a win in their previous matches and will be boosted when they meet for the 2nd time in this season on 17th January at The Gabba, Brisbane. In the last encounter between both teams, Brisbane Heat won it by 15 runs with DLS to play a part, as the rain interrupted the gameplay. 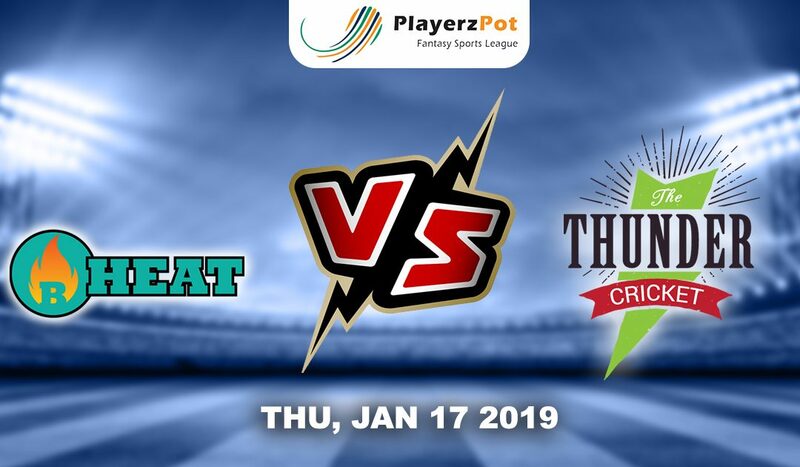 Sydney Thunders will be looking to take revenge in this match. Brisbane Heat stands on 6th position in the BBL ladder with 3 wins in 7 matches they played. The team will be boosted with their last match as they won it by an astonishing margin of 101 runs. Max Bryant and Brendon McCullum were great at the opening who scored 44 and 69 runs respectively. Chris Lynn scored a quick knock of 66 runs with a strike rate of 150. Brendan Doggett and Mitchell Swepson took 3 wickets each. Lalor got 2 wickets whereas Mujeeb and Ben Cutting got 1 wicket each and bowled out the team for mere 91 runs with 13 balls to spare in the 20 overs. Sam Heazlett and pacemen Mark Steketee comes into the 13 men squad in place of Marnus Labuschagne and Matt Renshaw. Players to watch out for: Brendon McCullum, Chris Lynn and Ben Cutting. Sydney Thunders with 50% winning ratio in the 8 matches they played stands on the 2nd position at the BBL points table. The team won their last match against the Strikers by 71 runs and will be hoping to repeat when they meet Heats. Watson played a 68 runs knock with a strike rate of 170. Ferguson was out on the 1st ball. Jason Sangha played a 30 runs inning. Bowling of the team was great as they bowled out Strikers for mere 97 runs. Arjun Nair took 3 wickets and other 6 bowlers got 1 wicket each. 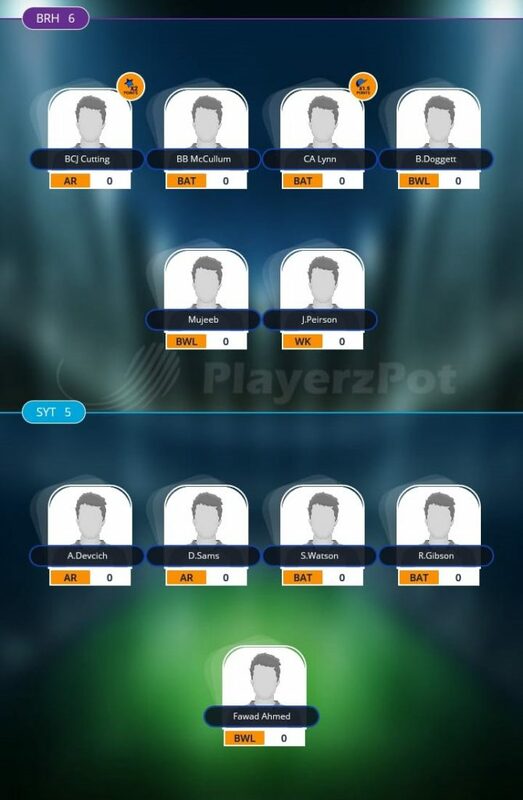 The team will be expecting a lot from their bowling line up. Nathan McAndrew and Ryan Gibson added to 13 men squad in place of Jason Sangha and Sam Rainbird. Players to watch out for: Shane Watson, Anton Devcich and Fawad Ahmed. Brisbane Heat: Max Bryant, Brendon McCullum, Chris Lynn (c), Sam Heazlett, Ben Cutting, Alex Ross, Jimmy Peirson (wk), Josh Lalor, Brendon Doggett, Mitchell Swepson, Mujeeb Ur Rahman. Sydney Thunders: Shane Watson (c), Anton Devcich, Callum Ferguson, Ryan Gibson, Daniel Sams, Arjun Nair, Jay Lenton (wk), Chris Green, Chris Jordan, Fawad Ahmed, Gurinder Sandhu. All-Rounders: Anton Devcich, Ben Cutting and Daniel Sams. Bowling: Brendon Doggett, Fawad Ahmed and Mujeeb Ur Raman. Brisbane Heats looks stronger team at their home ground and will likely to overshadow the Thunders for the 2nd time this season.